Margaret K. McElderry Books, 9781481420921, 320pp. 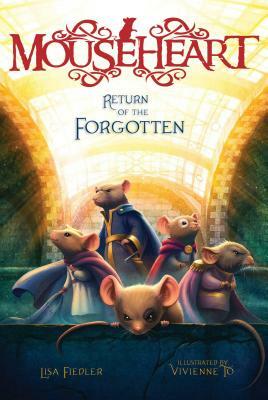 Loyalties are tested and secrets are revealed in this third book of the epic animal adventure series set in the subway tunnels of Brooklyn, ideal for “fans of Erin Hunter, Brian Jaques, and Kathryn Lasky” (School Library Journal). Hopper is determined to reach out to his brother-gone-bad, to see if he can talk some sense into the young rodent. But then Hope, the youngest of Zucker and Firren’s new litter, goes missing, and all signs point to Pup as culprit. Meanwhile, Firren is rattled not only by the disappearance of her daughter, but a shameful secret from her past that she’s kept hidden for years. A secret that may hold damaging consequences for not only Firren, but all of Atlantia. How can Pup betray his brother like this? What exactly is Firren hiding? And will the tunnels ever be the same again? Thetrilogy set in the world of mice concludes with a rousing adventure packed withrevenge, kidnapping, redemption, pirates, and a wedding. Hopper and Zucker arestill leaders of the underground city of Atlantia, and their friendship groundsthe narrative, but Fiedler allows “Chosen One” Hopper’s siblings to becomeimportant characters in their own right. This entry is younger brother Pup’sturn to shine, and he evolves from outlaw to hero as he helps rescue Firren andZucker’s children, held captive by a traitor to the city with an old grudgeagainst Firren. New readers may have trouble keeping track of the novel’sdifferent tribes and family trees, but fans will relish surprises in thebackstories of characters they have grown to love. Fiedler keeps the pacemoving quickly and the tension tight; the traitor’s identity is revealed earlyto readers but not to the characters. The peril is on the lighter side, making thisseries ideal for younger middle grade readers who enjoy animal fantasy. Thenovel’s New York City setting continues to be a strong, appealing element asthe rodent heroes venture into Manhattan, and Fiedler playfully mines localhistory and culture for character names, some obvious (Verrazano), some sublte(Vigneault). VERDICT A bonus story about the founding of Atlantiacaps this satisfying tale full of cat, rat, and mouse heart. A rousing adventure packed with revenge, kidnapping, redemption ,pirates, and a wedding…. satisfying tale full of cat, rat, and mouse heart.